We may find out pretty soon which cult TV shows are the cultiest, with a real big throw-down in the crowd funding moshpit. Veronica Mars creator and Kickstarter-master Rob Thomas has told Hit Fix that he was having his brain picked by another TV creator, pretty much right off the bat. You can make a $2 million or $4 million Veronica Mars movie. 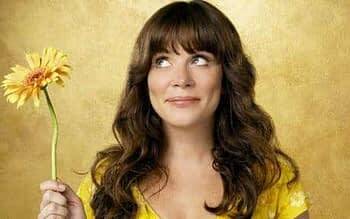 For something like Pushing Daisies, which is more elaborate visually and also would require extensive prosthetics and those sorts of complicating production elements, it’s a little more daunting. Not that he’s saying he won’t be pursuing the idea. Fuller went on to put a $10 million price tag on a Pushing Daisies movie. I fear that would consign a Kickstarter attempt to failure, at least if the entire budget would be dependant on pledges. I’m pretty sure the fan base for Daisies, as much as I’m personally fond of it, is much smaller than the one for Veronica Mars and I don’t think even this record-breaker of a scheme is going to get near $10 million. Still, put Pushing Daisies on Kickstarter and I’ll pledge. More likely to fall into the Veronica Mars budget range would be a movie version of Terriers, Shawn Ryan and Ted Griffin‘s superb private eye comedy drama. I don’t own the rights, Fox 21 does but maybe there’d be some upside for them if they didn’t have to chip in a dime but all of a sudden had a two hour movie as an asset that they could add to what they have on Netflix. And on the day of the Veronica Mars crowd fund explosion, Ryan took to Twitter and let us all see him kicking the tires again. I don’t think a $2 million stretch for a Terriers movie is too much an ask. I may be wrong, but if Ryan can work something out with Fox 21 that will let him do this, I reckon the money is out there. Of course, the rights owners didn’t even see the value in releasing Terriers to DVD so I won’t get too excited. Yet. Another possibility, and one I’ve seen Little Bleeders Tweet about or even mention in the forum here, is a Chuck movie, wrapping up Josh Schwartz‘s genuinely well-loved spy-caper series. If I had the power and the rights, I would have done it myself already. So much of the budget goes into advertising. If we came out with a Chuck movie now, I don’t know how many more people who didn’t watch Chuck would watch this movie. You don’t need to do a theatrical release. You’re doing it for the fans. You’d want to do an online release, and if people want to pay extra dollars to get the DVD and Blu-ray, you can make money from those purchases. I would keep overhead as low as possible [with] social marketing. Feels like a #Chuck movie would cost about $120 million.Big action set pieces.Plus we’d have to CGI Morgan’s beard. But, I say in a tone of mock outrage, that’s just greedy. You could make twelve Pushing Daises for that… and 60 Veronica Mars. I would imagine a Chuck film would realistically fall somewhere between the price range of Mars and Daisies. We might be on the cusp of a new production paradigm, if perhaps a short lived on. I think Terriers is looking the most likely of these candidates to become a campaign, let alone a funded project, though I’d honestly be happy to see them all get a new lease of life. So… when’s one of these big-shot entertainment magazines going to get quotes out of Mark Frost and David Lynch, eh? Don’t tell me they’ve all forgotten The Greatest TV Show of All Time already…?